FLOAT's Open House/Lunar New Year Celebration is coming up – February 22nd! We have been busy planning this fun event – hope to see you there! My baby is here. Why am I not happy? Dr. Wheeler will speak about the postpartum period and share valuable and useful tools for understanding this much-misunderstood phase of the childbearing cycle. All are welcome to attend this free event: new moms, seasoned moms, pregnant women and their partners, birth professionals, grandparents and caregivers. Please share widely with your networks and feel free to bring a guest! Many parents experience a wide range of emotions after the birth of a child. Some of us are elated, some have mixed feelings and others can’t seem to shake a nagging sense of anxiety, sadness or dread. Maybe you aren’t even aware of having any feelings of sadness or anxiety but are having a hard time sleeping or are feeling compulsive about certain things. It can go by many names. The baby blues, post-partum depression, post-partum anxiety. For some women it is a result of a hormonal imbalance after birth and can be treated with medication and/or holistic approaches (such as herbs, homeopathics, acupuncture, meditation, etc). For some it is the beginning of an emotional grief cycle or access to unresolved trauma that if left unattended can further bury the parts of them that are ready to be examined and healed. Come and learn more about how to take the first steps on this journey of exploration and healing! Snacks will be provided. Dr. Aimee Wheeler is passionate about helping parents strengthen their bonds with their children and develop greater understanding of the ways in which their personal histories impact the relationships they forge. As the mother of two young children, Aimee utilizes her personal experience and education to approach her work with compassion and understanding. Aimee received her undergraduate degree from the University of Southern California and her Doctorate in Psychology from The Chicago School of Professional Psychology. She is the founder of Parenting Discovery Center ( http://www.parentingdiscoverycenter.com). The Parenting Discovery Center works with individuals, families, caregivers and groups of parents to enhance their self understanding and build healthy and resilient relationships. We hope to see you on Saturday, August 11 from 10-11:30 am! Space is limited. 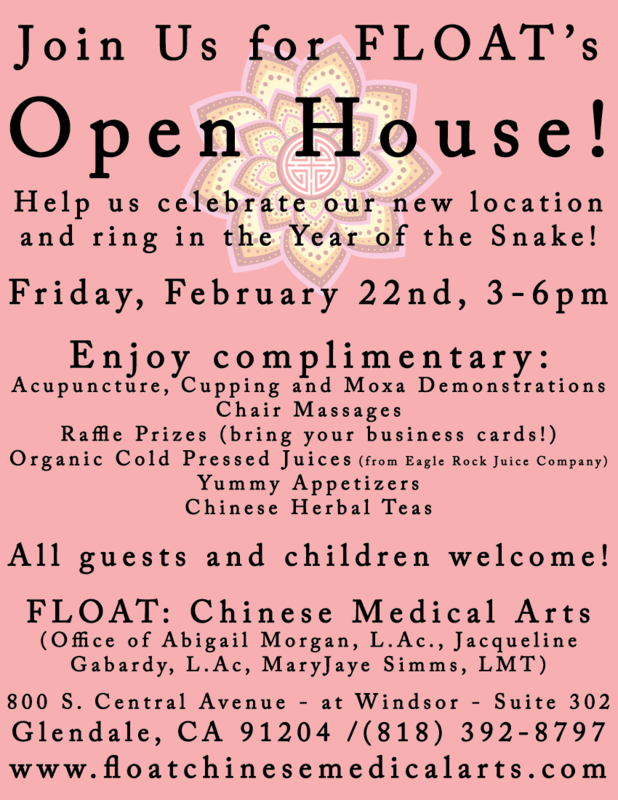 PLEASE RSVP to abigail@floatchinesemedicalarts.com or 818-392-8797. Other Upcoming Free Lectures at FLOAT: Chinese Medical Arts – please Save the Date! 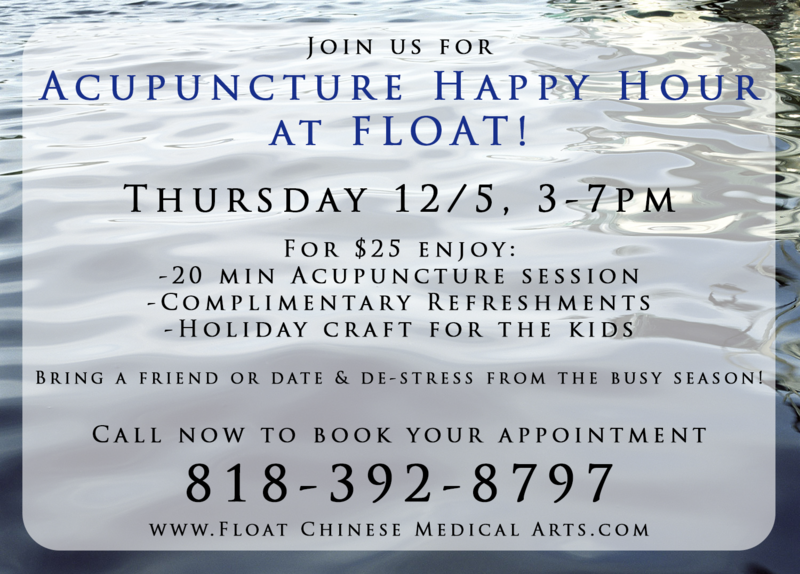 Again, PLEASE RSVP to abigail@floatchinesemedicalarts.com or 818-392-8797.